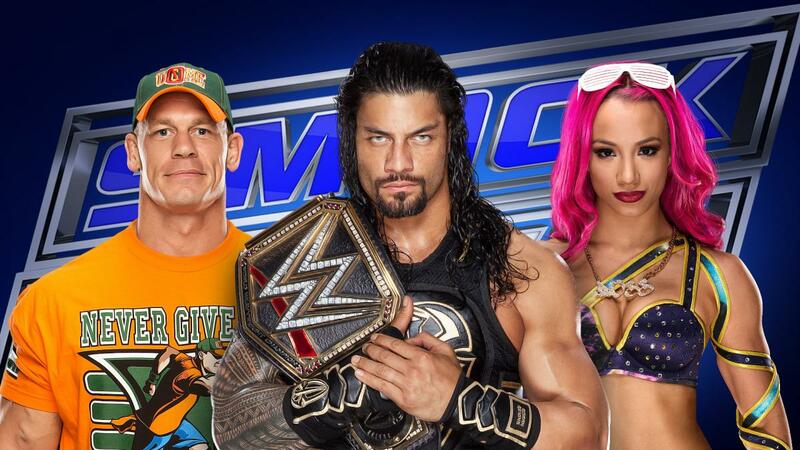 World Wrestling Entertainment announced that Smackdown will become a live show every Tuesday night at 8 p.m. ET on USA Network starting on July 19. It’s the first time in the show’s 17-year history that it will be live every week. WWE also revealed that they will bring back the brand extension that will split the WWE main roster into two, where half the talent will be on Raw exclusively and the other half will be on Smackdown. There are many questions that have come up since the news broke on Wednesday, so I’m here to tackle three important questions that were asked of me by the editors of The Comeback to try to make sense of it all. How did the brand split help or hurt WWE the first time? What was its impact and why did they go away from it? The original brand split began with a draft on March 25, 2002 with Ric Flair picking for Raw and Vince McMahon for Smackdown. Eventually, it became Eric Bischoff running Raw with Stephanie McMahon running Smackdown, and there have been others along the way. In the early days of the brand extension, they built it so that Raw and Smackdown were rivals. Whoever the WWE Champion was at the time (first Triple H, then Hulk Hogan, Undertaker, The Rock and Brock Lesnar) got to be on both shows. By September 2002, they introduced a second World Title with Bischoff giving it to Triple H. For the next 11 years, the shows had the WWE Championship and the World Heavyweight Championship until they were unified with Randy Orton in December 2013. It helped the company because they added a lot of guys to the roster in 2001 when they bought WCW and it was tough to utilize them all. By splitting up the roster, it allowed them to give more time to the younger stars or midcarders that were trying to get to the top. It led to the rise of some midcarders to World Champions like Eddie Guerrero, Chris Benoit and John Bradshaw Layfield. If they didn’t have the brand extension, perhaps some guys wouldn’t have been considered main event level players. By the time they got to 2010, the Smackdown brand was losing momentum. It was clear that WWE favored Raw more because the show has been around longer (Raw debuted in 1993, while Smackdown started in 1999) and most importantly, it was live. Since Smackdown’s inception, fans have gotten used to reading Smackdown spoilers late Tuesday night or early Wednesday. If you knew what was going to happen, why watch it? That’s what a lot of fans thought. The original brand extension ended on August 29, 2011 when Triple H announced that stars would compete on both shows. Once they did that, Smackdown became even less important because fans got used to seeing big angles only on Raw, while Smackdown was primarily the place for good matches once in a while, but nothing big ever really happened. Why is WWE doing this now and bringing it back? It’s a bold move by both WWE and USA Network that is being done to build up the Smackdown brand more than anything. By putting Smackdown live on Tuesdays, they are spending more money while also asking WWE fans to spend five hours on Mondays and Tuesdays watching their shows. When there are monthly WWE Network specials (those run four hours usually, counting the kickoff show), that means they are asking fans to watch eight hours of WWE programming in three days. Smackdown has moved around quite a bit in the last few years. It was on Friday night on Syfy for several years until being moved to Thursday nights last year. Then USA Networkput Smackdown on Thursday nights. It was still a taped show, but the feeling was that putting it on the more popular USA Network would give it a spark. The viewership numbers for Smackdown on USA remained about the same, though, so that’s why WWE felt compelled to make a move now. When they did the brand extension in 2002, the large roster was a main reason why they did it. That reason exists today because the company employs over 120 contracted performers on the main roster, as well as the NXT developmental brand. Building the roster has been something WWE has done for the last few years because they feel like accumulating the best in the world will lead to better shows. We’ve seen that with the likes of AJ Styles, Samoa Joe and Austin Aries getting signed in their mid- to late-30s after spending a decade in TNA Wrestling. Part of the reason they do it is to make themselves stronger, but it also hurts other wrestling companies because if those guys lose talent, then more eyeballs may watch WWE. One of the big differences between WWE today compared to five years ago is the WWE NXT brand. The developmental system in 2011 was okay, but it clearly needed an upgrade, which is what Head of Talent Relations Triple H has done in the last five years. NXT has been something of a shining light in the last two years as they continue to tell compelling stories while bringing stars up to the main roster. This is probably going to mean some of the bigger NXT names going to the main roster fairly soon. That means people like NXT Champion Samoa Joe, Bayley, Finn Balor and Shinsuke Nakamura. It also means that they will continue to try to build the NXT brand because if they lose some of those names, it could hurt NXT’s growth as a viable third brand. What does it mean for the company and fans moving forward? A much better Smackdown, for one thing. Those fans who only read about Smackdown for the majority of the past 17 years are suddenly going to care again, because there are no more spoilers. Live content is so valuable for any sports or entertainment company now, in terms of retaining viewers. Can they get the Smackdown audience to increase from 2.3 million average U.S. viewers on a Thursday? Probably. If they can get it up to 2.8 million viewers live on Tuesday night, then it’s worth the effort. If they get those extra viewers watching, then that means live attendance is going to go up, merchandise sales are going to rise and interest in the company is going to go up. Another major positive thing is more opportunity for talent on the roster that may not have been given a chance before. I mentioned guys like Benoit, Guerrero and JBL becoming top guys after the brand extension took place. Think of the comparable talent in WWE right now that could end up starring in the next year or two. The roster is loaded with talent that aren’t main eventing right now such as Kevin Owens, Sami Zayn, Cesaro, Dean Ambrose and so many others. Then there are the ones that are barely on television like Zack Ryder, who could really break out if given a chance. You just never know. It also likely means more live programming on WWE Network. I touched on that briefly above, but it wouldn’t surprise if they went from doing something like 12 annual pay-per-view events to 16 or even 18 per year. It might seem like a lot, but if talent is only seen on television once per week, then suddenly they are lot fresher by the time they have those pay-per-view matches. There are a lot of reasons to be excited about the brand extension with the main one being that Smackdown will become more of a must-see show again. We still need more information about who will be running the show on screen, which titles are on what show, if there will be two World Titles again and most importantly, who will be on what show. In the next two months, we should know more. It’s clear that WWE knew they needed to change things up, due to the product becoming stale. Give them credit for recognizing that. Now they have to execute on a plan to get things going in the right direction again.